How Does Polaris View the Indian Acquisition? 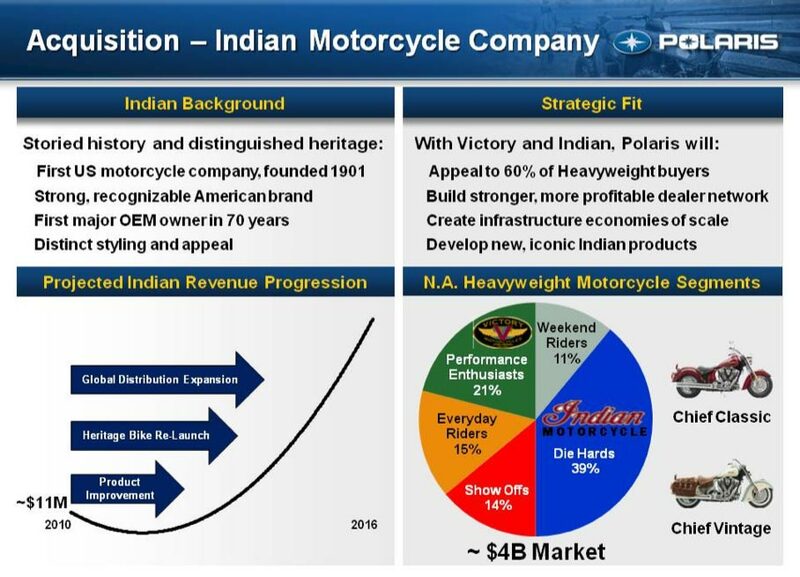 Polaris released some interesting info this past week to its stockholders, perhaps the highlight of which was how the Minnesota-based company views its acquisition of the Indian Motorcycle brand. Disclosing a brief summary of its plans, it’s clear that Polaris aims to go after the heavy-cruiser segment with a two-pronged approach, much in the same manner as we postulated back on Wednesday after news of the acquisition broke. More important than stroking our own egos, two pieces of interesting insight came from Polaris’s SEC filing 8-K filing. First was a glimpse into what the purchasing price of Indian could be, as a slide to investors shows Indian’s 2010 revenue as being $11 million, which would peg a baseline asking price of about $9 million, though the perceived brand value could raise that price. The second juicy morsel is how Polaris sees Indian fitting in with Victory, showing the potential of tripling Polaris’s motorcycle sales in the future. In the eyes of Polaris, the heavy-cruiser segment can be broken down into six groups, with Victory currently appealing to the performance enthusiast category. While that may seem like an oxymoron, the proof is in the pudding, and looking at Victory’s sales sheets, this segment group is growing. While Polaris only sees the performance enthusiasts accounting for 21% of the market segment, it hopes that the Indian Motorcycle brand can capture the attention of the “die-hard” riders in the category, a group Polaris pegs as comprising of nearly 40% of the market segment. With a larger available market comes a larger sales potential, and with all things being equal this could mean a 3x increase in motorcycle sales for Polaris. Using basic industry revenue valuation multiples, this potential sales bonanza likely cost Polaris a paltry $8.8 million or so, which is a cheap price to setup a powerplay to go after Harley-Davidson. It will be interesting to see what the actual purchase price of Indian will be, which will have to eventually get disclosed to stockholders. From that filing we’ll be able to see what sort of premium was put on the Indian name over the base revenue-derived valuation. It will also be interesting to see if this was a straight cash deal, or if Stellican Limited took some stock as well in the purchase (a strong sign in the seller’s belief that the purchaser will grow and add value to the company).